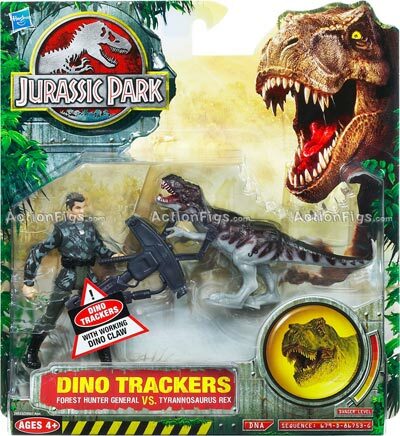 IT'S RAINING JURASSIC PARK 2K9 PICTURES! 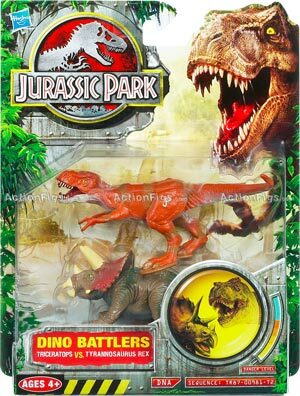 Wow, we only have the time to post the news about these new JP2K9 pictures that the folks over at Actionfigs.com added several new ones on their website! 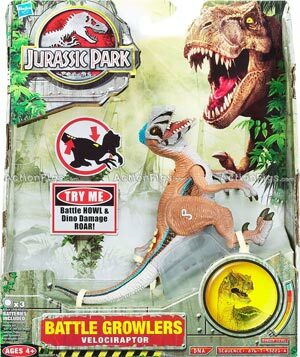 So, we now know what the two other Dino Trackers sets look like, and also can lay our eyes upon the new electronic JP3 repaints: the Battle Growlers! 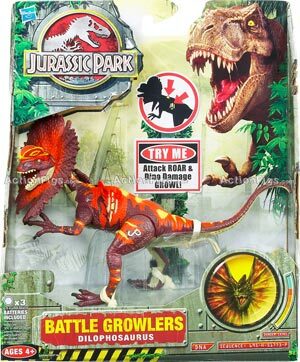 So, make sure to take a look at Actionfigs.com to have a full-quality look at these brand new zany JP toys! JURASSIC PARK 2K9 PICTURES, AND LOTS OF THEM! 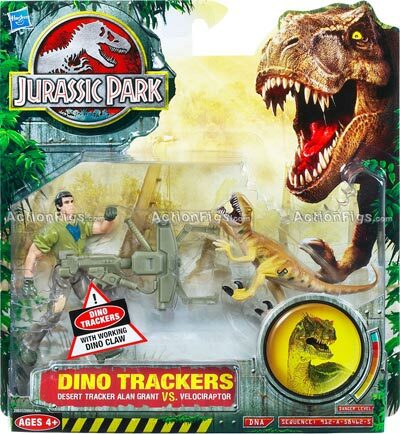 As you know, the new Jurassic Park toyline has been delayed, and will only be released in August. So, what's the best way to kill time? To drool over new pictures! 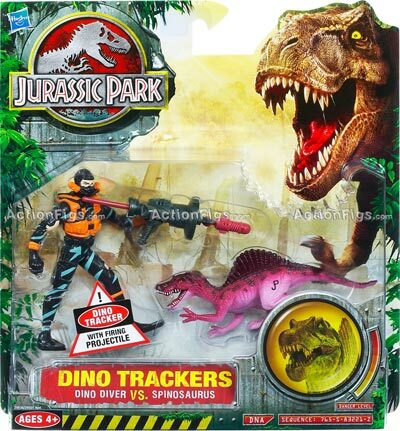 The good folks over at Actionfigs.com got their hands over several pictures of the four Dino Battlers packs, and two of the new Dino Trackers human/dinosaur set, and were kind enough to let us know about them. Make sure to take a look at their website to see these new sets in all their high-definition glory! By the way, this brings an interesting point. 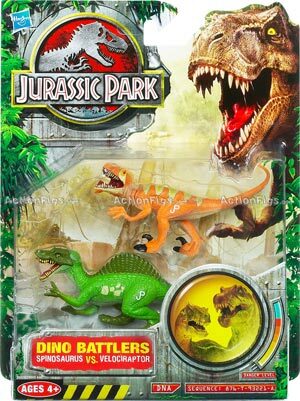 Considering the "Dino Battlers" name is only used for the small two-packs, and not for the whole toy line, how could we name it? 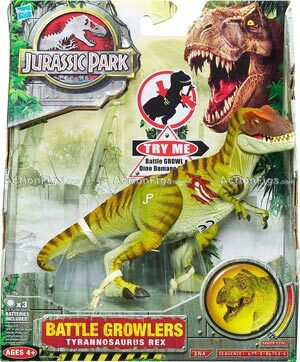 For the time being, we'll settle for Jurassic Park 2K9, but feel free to share any idea you might have on the forums. 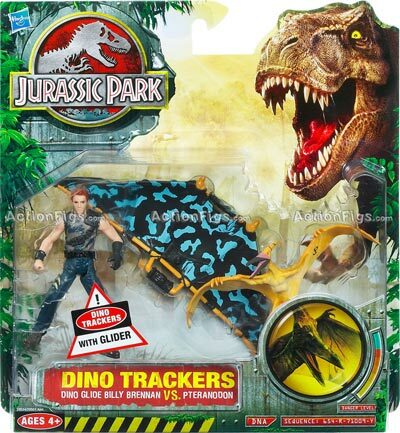 Also, the set we saw a picture of a month ago, the T-Rex/Trike one, seems to have been slightly repainted (yup, both sets share the same assortment number, so unless it's a variation...). For the better or worse, you decide! 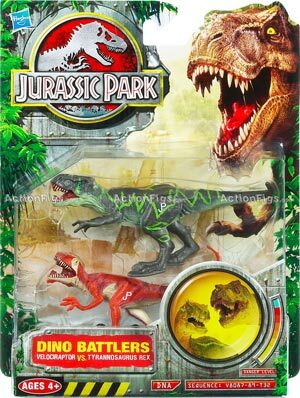 JURASSIC PARK DINO BATTLERS LINE DELAYED! I called tons of TRU's in all of Europe and the US too, and tons of Hasbro's in Europa and the one in the US. What did I find out: there are at least a dozen of new figures to be released. So not 4, at LEAST a dozen. When will they be released? The SECOND WEEK OF AUGUST. Strange enough NO Hasbro's in Europe have them in their database, but the American one has (unfortunately no pictures, I asked them). As of TRU's, as far as I know they will be released in the UK, Germany, Switzerland, Austria and obviously the US. And best of all: the German women said she saw an Electronic T-Rex in her database with figureS. We haven't seen that before have we? That might explain the price! Stay tuned, I’ll call the French TRU back in a minute for more info. 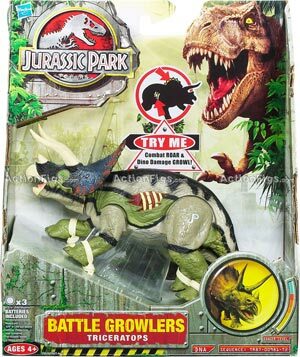 And after contacting the French TRU manager, she got a juicy bit of information: the name of some of the dinosaurs featured in the line! He didn't see the large T-Rex in his database yet, but he told me they rarely have anything in their database more than a month before release. He also saw a loose action figure called Patron PT (wtf?). It is possible I didn't write that one down correctly, he talked French with a REALLY big accent, it was very hard for me to understand him. I had him spell that name 4 times for me, so I think I come very close to the real name now. -=EDIT=- Neelis stated that the Patron figure might be a Pteranodon. Because the French guy had a hard time pronouncing it, there's a good chance Neelis is right. Price range was from $7 - $17, which was not put in Euro's yet. Unfortunately, he had no pictures in his database, so I couldn't obtain any. I also tried to had him describe some figures, but as he had no pics, he couldn't. 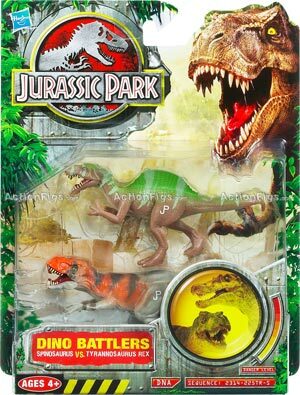 Judging from the figures, I can say for certain it will be a JPIII repaint series again. Note: these are not all the figures, only the ones in his database. So there are more to be released anyway. Only, he couldn't tell me how many. So, a huge thanks goes to Dutchallosaur for taking so much of her time to give us all these news!